You know, those of us who are doing okay in life…not fabulous, yet not worrying where our next meal is coming from, or how we’re going to keep a roof over our heads–literally, are at risk. We’re at risk for going through the motions…doing what we’re supposed to do…looking good on the outside. But so often we’re crying out inside. Not so much so that we would ask for help, or so as you’d notice, but just enough that we need someone, somewhere, to give us a reason to keep on moving forward, to keep reaching for a better life, to make something beautiful and meaningful in this world with so much sadness…so much ugliness. And today, I, Lisa Casas, aka, “WittyBizGal” got that reason. Liz Murray ate lunch with us, then rose to speak inspiring, motivational words to our graduates, first through sharing her harrowing tale of a childhood with drug addicted parents, not enough food to eat, and no external encouragement for her to end up any better off than her role models, who sadly eventually died of AIDS. Then came the truly important part–how she turned that little spark inside of her, that spark we all retain no matter how old we get or how jaded we become, into a flame which carried her through the Harvard intake interview and New York Times Scholarship interview on the same day, both of which she almost, almost blew off. And today, with my more or less ordinary life that nobody would ever consider making a movie about, and my little blog that I think only my friends, family, and probably a few frenemies I’ve collected over the years read, Liz’s words helped me find that spark in myself again. At just the point where I had begun to ask myself, “Why bother?”, I remember why…Among other reasons, the world needs people who believe in themselves, and believe in their own dreams. Because it’s catchy! First, believe in yourself, then go out there and motivate somebody else to do the same! I’m about 1/3 of the way through Breaking Night myself, so stay tuned for a book review on that! A lot has been written about how to motivate employees to work towards achievement of organizational goals and objectives. There are also various theories of motivation itself. Almost everyone has heard of Maslow’s Hierarchy of Needs, which classifies human needs into five broad categories; physiological, safety, belonging, esteem, and finally, self actualization. In a nutshell, Maslow theorized that people’s needs must be met in this ascending order, beginning with physiological, and ending with self actualization. In other words, don’t even try to talk to them about how much they need to care about all the lofty goals of the nonprofit they work for, if you’ve been overly long winded at a pre-lunch staff meeting, and all they can think about is that PB&J sandwich in their desk drawer. Other researchers in the field of psychology have devised other motivation models, but Maslow’s remains my personal favorite. It explains, in the most basic of terms, what makes people tick. Once you understand which needs motivate them at a given point in time, you can better understand how to motivate your staff to help you achieve the vision and mission of the nonprofit organization. So, here goes…not necessarily in order of importance, don’t think of it that way. Think of it as a sequence which must be followed, so you’ll spend less time spinning your management wheels, and more time achieving your management objectives. Just about everyone who works has some sort of monetary motivation for doing so. I’ve read a lot of articles and textbooks, etc. that make the assertion that people’s primary motivation for working is not salary or hourly wages, bla, bla, bla. This is simply not true. When push comes to shove, to varying degrees, people usually work in a paid position because they need the cash to cover their rent or mortgage, buy food, clothes, etc. 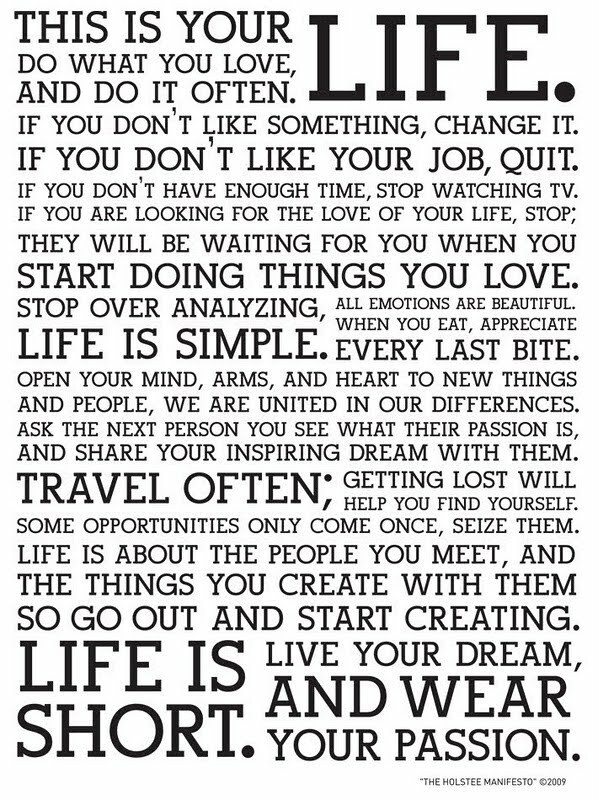 Once these needs are basically addressed, then they have the luxury of thinking about other things they might want. While it is not always possible for nonprofits to exceed the market in terms of competitive wages, all nonprofits should strive to at least meet the market. I don’t know of any organization that has achieved much of anything by following a lag the market strategy. In order to attract and retain the human resources you need, you must strategize to pay your people competitively for the positions they hold. So, first and foremost, develop a compensation strategy that can be consistently applied throughout the organization. This means you should have rhyme and reason to how you pay everyone in your organization. It needs to make sense, relatively speaking for each position, and have a sensible range at each pay grade which can be tied to performance, which we’ll get into later. Get hold of some current salary survey information so that you can effectively benchmark those grades and ranges too, and compete for the best and the brightest in the candidate pool. The Nonprofit Times offers this information for a relatively small fee here: Salary Survey Data Tax Free, of course…:-) If you can’t afford that, be creative. Make some investigative calls to other area nonprofits and gather as much information as you can from them, enough to help you get an idea of where to set your own compensation framework. People need to feel reasonably physically safe in their work environment, and they also need to feel relatively secure that their organization is stable and their job will not disappear inexplicably overnight. First and foremost, get your risk management ducks in a row and develop workplace policies on safety, security, sexual harassment, etc., and put some weight behind a simple paper policy that sits on a shelf gathering dust by planning and conducting regular training on each of these. The best place to go, always, for human resource management related information, forms, and best practices is the Society for Human Resource Management, or SHRM. Some resources are free on the website, and some require membership with SHRM, which is well worth the annual fee. Your employees need to feel as if they are part of a team. Teamwork is a business buzzword that is tossed out a lot these days…by organizations trying to make themselves look like one big happy family, and by desperate job seekers trying to make themselves look like they will fit right in–anywhere, so that they can meet Need #1, Physiological. But, quite frankly, high functioning, cohesive, healthy workplace teams are much rarer than these folks would have you believe. If you are looking to foster real teamwork in your organization, there are many books and resources out there to give you advice. Hint: Avoid books that are overly gimmicky, and offer a too-simple-to-be-believed, easy recipe for teams. 1) Create a Team Charter–it needn’t be overly formal or complicated, but should probably be written down, and it should clarify the broad purpose or task of the team, specific, measurable objectives for achieving that purpose or goal. 2) Set Ground Rules & A Game Plan–This may seem like overkill, but the expectations of each member of the team should be established, both behavioral and task, and these should be written down, and acknowledged by each team member with a signature. 3) Create Communication Guidelines–Once again, this may seem silly to actually think about and write down and have people sign, but trust me, it’s not. We may think we are all adults and will act like it in the workplace, but I have seen grown ups on teams behave like kids on a playground when a miscommunication or lack of communication occurs. There are so many ways communication can break down, and when it does, your team can fall down a well that even Lassie cannot pull them out of. Think about all of the potential pitfalls of your team’s communication, and establish rules to follow for effective communication, active listening, and conflict resolution. People who work need to feel good about what they do on a daily basis, so they will have a reason, a motivation to keep doing it, and to help you achieve the mission of the nonprofit organization. The best way to ensure that they will feel good about their jobs is to develop a comprehensive system of performance management. Notice I didn’t say performance evaluation, because they are not the same thing. Performance evaluation is one piece of performance management. 1) Effective organizational and interpersonal communication: Comprehensive job analysis and descriptions & telling people exactly what is expected of them–don’t assume anything. 2) Goal setting: Involve the employee in setting performance goals for themselves at regular intervals from the beginning, not just once a year. 3) Ongoing feedback, to guide and shape the job performance of individuals to better meet the mission of the organization: Make feedback regular, perhaps daily and weekly, in order to shape performance on an ongoing basis, again NOT JUST ONCE A YEAR at performance evaluation time. Aside from their sense of doing a good job in the position for which they were hired, employees need to feel as if they are contributing in a meaningful way toward serving the mission, and the client group. In other words, your staff needs to feel like they have a direct impact upon achievement of the mission, whatever that may be. So, how does a receptionist for a nonprofit organization feel as if he or she is making the world a better place while answering phones, routing calls, greeting the public, typing and filing all day? Simple! Re-design jobs to increase direct contact and interaction with the client group, and also that individual’s input and control over how the mission is achieved. You will want to start with job analysis, also mentioned in #4, and consider adding elements to job descriptions which are designed to give every position more interface with the client group. For example, you might want to put a Receptionist in charge of developing and maintaining a client satisfaction survey program, or something of that nature. And add cross functional teams and committees to your organization. There is absolutely nothing wrong with a permanent team or temporary committee being comprised of executive staff and line employees. In fact, this makes a better team all around! This is because you introduce diversity of perspective into the mix, which, when combined with the great teamwork you developed in #3, along with effective dialogue, and a sense of openness in communication regardless of position level, can propel your organization to greatness! No nonprofit, or any organization for that matter, has ever benefitted in any meaningful way from homogenous teams, groupthink, and line employees who are afraid to share their perspectives and ideas for improvement. Once again, you can always find great information on the SHRM website for anything employment related, including job analysis and job design. I hope you have found these motivational guidelines, inspired by Maslow and designed by me, to be useful and applicable to your own nonprofit organization. If you have additional information you’d like to share about your own experiences with motivation in the workplace, please feel free to comment below! I met Mary Foley a few months ago when she traveled here to Florida to deliver the keynote speech for my organization’s Independence Program graduation ceremony. Our purpose is to empower women in our community to work toward their own independence—financial, and otherwise. Many of our graduates had fought tough battles over the nine months they were with us in order to reach that amazing day when they could stand up assert to all of us in the audience that they had made impressive strides, and were well on their way to being strong, independent women who were now prepared to support themselves and give back to the community. These gals deserved something special—or should I say someone really special, and Mary Foley did not disappoint! She made the graduates and all of us in the audience laugh and cry and feel great about being women. Then she inspired each of us to look inside and first figure out what we (not our mothers, our husbands, our sisters, or our kids) wanted out of this life we’ve been given—and told us to go out there and get it! So, for this fifth and final in my series of Authentic Winner E-terviews, I am so honored that Mary graciously agreed to share with us a little bit about who she is, what she found out that she wanted out of life, and how she got it. I know you’ll love Mary Foley as much as I do, and will be inspired to get out there and live your own dreams, whether you’re a man or a woman. WBG: Mary, you jumpstarted your career at a little company called America Online, back when it really was little. What was the one most important thing you learned during your time at AOL about being a successful working woman? Mary Foley: When I was 23 years old with a newly earned industrial engineering degree, the only thing I knew was what I didn’t want for my career. I didn’t want to be an engineer! I truly wished that someone would have waved a magic wand to tell me what I should do, where I should direct myself. There wasn’t anyone. It was up to me to decide, so I decided to move to a metropolitan area with lots of jobs and get started in something, anything, to pay the bills. From there, I could evaluate and make more choices. I learned a lot of lessons during my AOL career, but the biggest one I learned is that you are in charge of your career. You are ultimately the only one responsible for your career (and life for that matter). 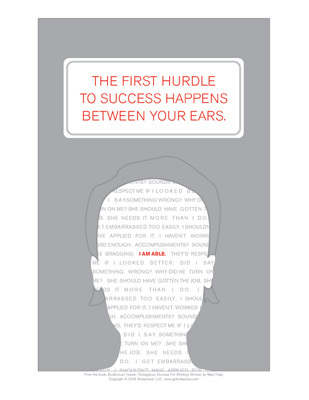 And the first hurdle to success is between your ears. You have to determine where you want to take your career. There’s no waiting for someone to tell you, there’s no pre-determined path. So, learn all you can from mentors. Utilize all the career development opportunities that are offered by your employer and otherwise. But, the final direction and decisions regarding your career are up to you. WBG: These days you travel all around the country teaching women how to “increase their sanity, confidence, and fun” and talk to women about women’s issues on your “Girlfriend We Gotta Talk” radio show when you’re back home in Virginia. I bet you’ve learned a lot about women! What are three things we all have in common, no matter what our walk of life, income level, or educational & career background? Mary Foley: We are so much more alike than we are different! We all want to feel good about who we are, we all want to feel confident in being able to handle life, and there’s not a woman yet that I’ve met that doesn’t want to laugh more often and more easily. The good news is that since so many women want the same thing, we can share what works and be there to support one another! WBG: Who is the most interesting guest you’ve ever interviewed and featured on your radio show, and why? WBG: If I decided to branch out and start a WittyBizGal cosmetics company, I would want to include a nail color line. I want to name 3 nail polishes; one for you, one for your mother, and one for your radio co-host. What would I call those three polishes, and what colors would they be? 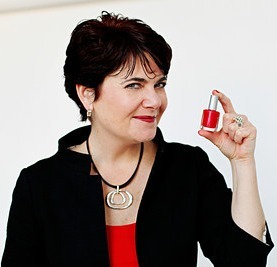 Mary Foley: I would say I have 3 fabulous colors that I’ve already created that are perfect for you! “Perfection is SOOO Over-rated” is my cappuccino nail color that I like wearing myself that’s a perfect reminder for my driver personality to just chill. “Little Miss Smarty Pants” is a fun medium purple color that was created to honor my mom who would teasingly use the phrase to describe me and my sisters. I always smile when I say this nail color name! “Laughter is My Face Lift” perfectly describes my friend and “Girlfriend We Gotta Talk!” radio show co-host Susie Galvez. We share lots of laughs, even when we’re talking about serious subjects. And, the fact that she’s a beauty expert just tops it off! 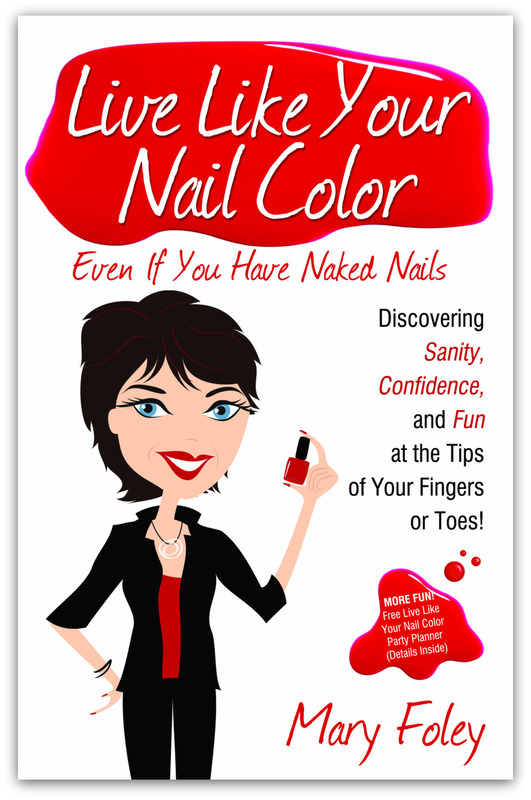 WBG: Your book, Live Like Your Nail Color, along with its related speaking engagements and parties has been wildly popular and successful in getting busy women like me to sit down and think about who we really are & what we want out of life, all while taking a much needed break while our nail color dries. Can you give us a hint about what we can expect next from Mary Foley? Mary Foley: Given these challenging times, women want more ideas on creating sanity for their lives and confidence for their careers. So, I’m redesigning my website maryfoley.com and creating a Facebook page to share more ideas to help. In addition, I’ve created some new live, in-person programs including about thriving on change and tapping into the secrets of successful women. I look forward to a continued conversation – we’re all in this together!